Amoeba is the work of Robert Rich on percussion, synths, steel guitar, winds, and vocals, and Rick Davies on guitars and bass, with guests on cello, saxes, percussion and vocals. The two have been working together off and on since 1980, and Rich, in particular, has an extensive catalog of what I gather are mostly ambient works. 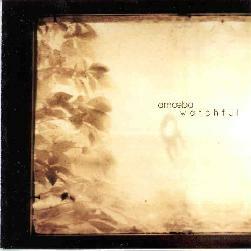 The music on "Watchful" is dark and dreamy. Throughout the eleven tracks the music is easy going with a trademark sound of repetitive bass and percussion beats with spacey vocals by Rich that remind me a little of a male Gillli Smyth. The closest comparison I can think of is a cross between Shadowfax and Michael Hedges (without the guitar pyrotechnics), and that is mostly due to the rhythms and similar use of wind instruments. But Amoeba actually gets far freakier than either of those artists. Among my favorites on the disc are the opening track, "Inside". The song opens with eerie chanting and a somewhat Middle Eastern percussion beat which remains constant throughout. The guitar takes the tune a bit into orbit with some Manual Gottsching type freakout playing. This guitar isn't representative of the rest of the disc but the overall sound is. "Desolation" is a very dark tune with more spacey guitar that serves as a background to the vocals. The vocals sound somewhat dissonant against the instruments and the effect is pretty wild as the acoustic guitar is new agey while the electric guitar more space freaky. Overall a very interesting collection of dark mind music. You can visit Amoeba at their web site. The Lektronic Soundscapes label has a web site full of great electronic music.